his Fresh and Fruity website is owned and operated by Fresh and Fruity (ABN: 60618925026). By accessing, browsing and/or using this website, you agree to the terms, conditions and disclaimers herein as amended from time to time. By purchasing an item advertised on this website and/or becoming a member of the Fresh and Fruity newsletter, you agree to these Terms and Conditions. Fresh and Fruity may amend these Terms and Conditions from time to time and any amendment will become effective immediately. Your continued use of this website after amendment constitutes an agreement to abide by and be bound by those amended Terms and Conditions. This site and its contents are subject to copyright. The site material copyright is owned by Fresh and Fruity, or in the case of some material, a third party. The site function and operation copyright is owned by Fresh and Fruity. You agree that your access to, and use of, our Fresh and Fruity site is subject to these terms and all applicable laws, and is at your own risk. This site and its contents are provided to you on “as is” basis, the site may contain errors, faults and inaccuracies and may not be complete and current. Fresh and Fruity makes no representations or warranties of any kind, express or implied as to the operation of this site or the information, content, materials or products included on this site, except as otherwise provided under applicable laws. Neither Fresh and Fruity, nor its affiliates, directors, officers, employees, agents, contractors, successors or assigns will be liable for any damages whatsoever arising out of, or in any way related to, the use of this site and any other site linked to this site. This limitation applies to direct, indirect, consequential, special, and punitive or other damages you or others may suffer, as well as damages for loss of profits, business interruption or the loss of data or information. Prices of our Fresh and Fruity products and services, delivery and other charges displayed on the Fresh and Fruity web site are current at the time of display. These prices are subject to variation without notice. Fresh and Fruity will always attempt to be as accurate as possible with our products and services, descriptions and pricing. However, we are unable to warrant that product descriptions or other content of our web site is accurate, complete, reliable, current or error free. While Fresh and Fruity will abide by the applicable law in relation to the supply of its products, no exchange or refund will be accepted if you change your mind. At Fresh and Fruity, we believe our products and services are of the highest quality. We hope you agree after receiving one of our bouquets services. There is no money back guarantee. However, we care about our customers and will deal with each situation individually as they arise. We will be more than happy to replace any arrangement that has not met your quality expectations free of charge on the condition that we are contacted within 24 hours of delivery. If you are not satisfied for any reason, please do not hesitate to contact one of our staff on (03) 9737 1002. All prices on freshandfruity.com.au are listed in Australian dollars (AUD). Placement of an order by you constitutes an offer to enter into an agreement with us. We will contact you for the sole purpose of confirming the details of your orders. Orders will not be dispatched until payment in full has been received or full payment details have been personally arranged with one of our staff and Fresh and Fruity is satisfied with the integrity of the order. Without limiting the operation of the Terms and Conditions, Fresh and Fruity is not responsible for any loss or damage caused by late delivery or cancellation of an order, product or service. Fresh and Fruity reserves the right not to provide goods or services, remove or edit content or cancel orders at our discretion at any time. Without limiting the operation of the Terms and Conditions, we will not be held liable for loss or damage arising from the exercising of these rights. Containers used for our range of fruity bouquet products may vary according to availability. Our agreement with you only comes into existence once your payment has been processed. Once we have accepted payment for an order, cancellation of the order is within our sole discretion and dealt with on a case by case basis. If you need to cancel an order, please contact us immediately on (03) 9737 1002. 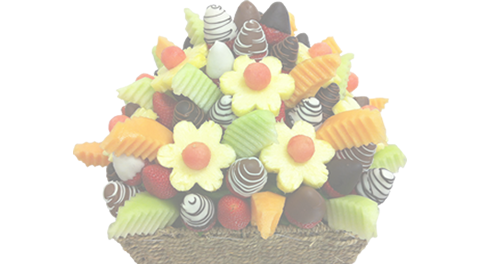 Our Fruity bouquets are beautifully packaged and delivered to your home, office, party or event. A delivery fee of $10.00 applies to each order. *We recommend that you place your Fresh and Fruity bouquet or product order in advance – at least a day or two before as sometimes same day orders are not guaranteed. If you order for same day delivery the bouquet will be delivered in the afternoon or evening. **Orders placed after 9am for same day delivery are subject to availability. For Sunday deliveries, orders need to be placed before 4:00pm the previous Friday. **If orders are placed over the weekend, they will be delivered on Monday. We are closed on Public Holidays. Fresh and Fruity offers a delivery service to most of the Melbourne metropolitan area with delivery of $10 to most areas – some outer suburbs are UNAVAILABLE. When you provide your home delivery information, please leave detailed instructions in the ‘special instructions’ section of the order form so that your bouquet can be delivered safely, especially if you will not be home. If the incorrect delivery address is supplied or if there is no safe place to leave the bouquet when no-one is home, they will be returned to Fresh and Fruity and we will contact you to arrange re-delivery. Re-delivery on the same day as the original delivery date may incur an additional fee. To avoid these costs, please carefully consider the delivery address you enter. Note: We do require a valid phone number on your order to assist in contacting you immediately should we have any questions or concerns regarding your order and/or delivery information. We will provide you with an estimated time for delivery of all Fresh and Fruity bouquets. However, while we make every effort to deliver by this time, all times specified are estimates only. Fresh and Fruity will attempt to deliver to business addresses between 9am and 5pm, and to home addresses up until 6pm. However, we are unable to give a guaranteed time of delivery. Without limiting the operation of the Terms and Conditions, you agree that late delivery does not constitute a failure of our agreement, and does not entitle you to cancellation of an order. Fresh and Fruity cannot guarantee that any file or program available for download and/or execution from or via this site is free from viruses or other conditions, which could damage or interfere with data, hardware or software with which it might be used. You assume all risk of use of all programs and files on this site, and you release Fresh and Fruity entirely of all responsibility for any consequences of its use. This site may contain links to third party sites. Fresh and Fruity is not responsible for the condition or content of those sites as they are not under Fresh and Fruity control. You access those sites and/or use the site’s products and services solely at your own risk. The links are provided solely for your convenience and do not indicate, expressly or implied, an endorsement by Fresh and Fruity of the sites or the products or services provided on the site. Fresh and Fruity does not permit any linkages to this site without prior permission. This site is controlled by Fresh and Fruity. Your use of this site is governed by, construed and enforced in accordance with the laws of Victoria, Australia. Disputes arising from your use of this site are exclusively subject to the jurisdiction of the courts of Victoria, Australia. This site may be accessed throughout Australia and overseas. Fresh and Fruity makes no representations that the content of this site complies with the laws (including intellectual property laws) of any country outside Australia. If you access this site from outside Australia, you do so at your own risk and are responsible for complying with the laws in the place where you access the site. When purchasing from Fresh and Fruity your financial details are passed through a secure server using the latest 128-bit SSL (secure sockets layer) encryption technology. 128-bit SSL encryption is approximated to take at least one trillion years to break, and is the industry standard. If you have any questions regarding our security policy, please contact our customer support centre at enquiries@freshandfruity.com.au . Fresh and Fruity highly value the strong relationships we have with our customers and are committed to safeguarding your privacy online. The collection of data at Fresh and Fruity is being handled with full and proper respect for the privacy of our customers. The data we collect is handled sensitively, securely and with proper regard to privacy. Fresh and Fruity does not disclose, distribute or sell the data we collect from our clients to third parties.